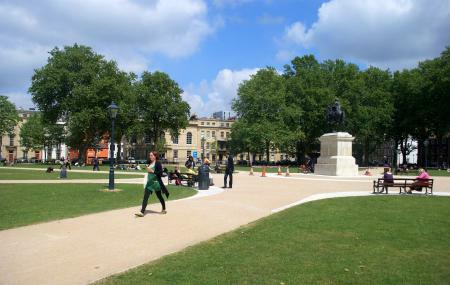 The Queen square is garden in the centre of Bristol city and is one of the best attractions in the city. The place was meant to be a fashionable and high end residential place but later became an office occupied area. The pace has picturesque views and greenery that will refresh your heart and soul. The place is perfect for picnics and walks at any time of the day and there are many events that go on in that place. The timings mentioned are for the park office for any information. The Grove (Stop bm) is the closest bus stop in the place. How popular is Queen Square? People normally club together M Shed, Princes Wharf and Watershed while planning their visit to Queen Square. Lovely park square with a reasonably sizes green space, nice monument in the centre and plenty of benches and area to sit down. Is generally a quiet park and can be a nice place to sit down for a short while or even take a short walk around if you're in the area. We lived this little park! We crossed through most everyday several times. This neighborhood has so much to offer. We we're on our way to and from pubs, restaurants, shopping and more. The statue in the middle is a connection to the area history and England's contrast to our American culture. Nice selfie opportunities. Good place for group photos. Building and interesting items photos. Take a 360 degree video with mobile to send to friends and relatives. What a brilliant park in the heart of Bristol! We had gorgeous weather on our visit and enjoy a good wander/walk-about, so we set out and serendipitously stumbled into Queen Square. Look at all this green space! Take a picnic, have a nap, play games, relax in the sunshine. A perfect respite from all the busy-ness of King Street or Stokes Croft. Access is relatively easy, but parking can be very expensive. Quite noisy as it is in the centre. There are some good pubs nearby, but they are expensive. Cobbled surface can be rough on the car.